On Friday night following screenings of Valentino: The Last Emperor at City Cinemas, Vogue's André Leon Talley sat down with director Matt Tyrnauer for an audience question-and-answer session. Preening in his signature red Valentino graduation robe, André and Matt discussed everything from the fabulous scene with Valentino's five pugs getting their teeth brushed to the importance of having male models on the crew. If you haven't seen the movie yet and what you read below doesn't convince you to, you might not have a soul. Audience Member: How did you get Valentino to let you film the pugs' teeth getting brushed? Matt Tyrnauer: He has a valet with the exclusive job to do the "toilette" of the dogs. They had special animal toothpaste and pug-length toothbrushes. Another time I saw this male model, who turned out to be his chauffeur, emerge with two silver bowls covered with Saran wrap. He went over and set them on the ground and I realized they were for the pugs — we were in Paris and he’d driven all the way from the château to deliver food that the chef there had made for the pugs. 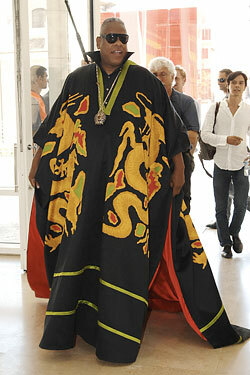 André Leon Talley: Very Duchess of Windsor. ALT: When you had to show a rough cut to Mr. Valentino and Mr. Giammetti, did they take knives to your throat? MT: Let’s just say I had no lawyers when I started, and now I have 18. After they saw the film, I thought they were characters in One Flew Over the Cuckoo’s Nest. I showed them about five initial versions, all of which they hated. Giancarlo volunteered to move to New York for six months and edit the movie by my side. That finally changed at the Venice Film Festival. We were sitting in the balcony along with Valentino’s people, and afterward, the audience gave a very long standing ovation, which Valentino received like Mussolini. There’s something about Italians and balconies. Audience member: How did Valentino and Giammetti always look so perfect? MT: We never started our filming day before noon. At noon they would appear. Presumably the morning was for bronzing, coiffing. That woman who had the pneumatic-breast issue told me that one summer Valentino was accidentally made a blond. Audience member: When Valentino calls Giancarlo from Gstaad, does he not know how to dial long distance? Because he has a butler do it for him. MT: No, he doesn't. There would be a dialing situation. He lives a life that hasn’t existed for 50 years. Valentino never changed. He’s very anachronistic, but he was still relevant because he was a genius at what he did. ALT: Karl Lagerfeld knows how to dial. Audience member: How was it doing this as your first film? Audience member: André, Valentino dressed you himself for his big 45th Anniversary celebration in Rome. How does wearing Valentino make you feel different? ALT: It’s a dialogue and a process. For this piece, there was the adventure of going to Rome. Picking the fabric — well, actually they picked the fabric — rushing straight from the airport to the atelier. But I had Valentino suits back in the seventies. Valentino made my day suit for the wedding of Paloma Picasso in Paris. I think Karl Lagerfeld designed my evening suit. Audience member: Why is there very little physical affection between Valentino and Giancarlo? MT: It’s a 50-year male relationship. ALT: They don’t live in the same houses. Valentino has his villa, Giancarlo has his apartment in Rome. Valentino has his château outside of Paris, Giancarlo has his apartment on the Seine. There’s affection, but it’s a different way of showing it. It’s like how French couples have mistresses. MT: I call my film the geriatric Brokeback Mountain.